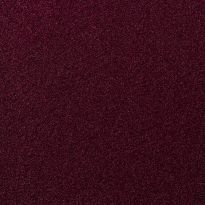 It's easy to apply a durable, professional looking interior liner that resembles velvet. Just apply the undercoat adhesive and then spray on the fibers. 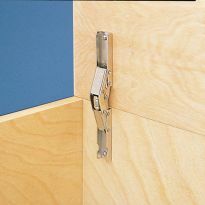 Adhesive covers approximately 10-12 square feet. You will need both adhesive and fibers. Squeeze the tube to spray Suede Tex fibers. Using a separate tube for each color is recommended. Adhesive: 8 oz., Fiber: 3 oz. I purchased the mini-locker, glue and "flock" to line the drawers of my first bandsaw box. The products were awesome. The box was a gift for my daughter Riley for her birthday. It's simple but does what its supposed to do and does it well. Perfect for the job and easy to use. Was actually worried about doing this. It was as easy as they stated and had no problem doing it. Works just as advertised. It does a great job. 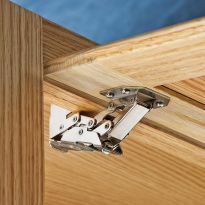 This great product worked as expected giving a touch of class to the inside of small band saw box drawers. Wasn't sure at first when I used this, but the end result of the project was really nice. The flocker worked perfectly and allowed for a beautiful fiiished product! This flocking tool is so easy and a great way to finish a project! 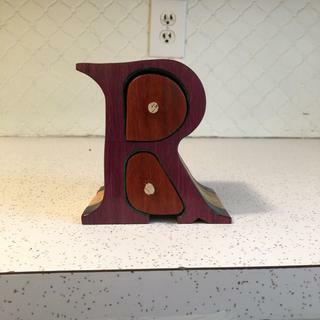 A gentleman at our woodshop recommended adding flocking to a present I was making for Christmas. So, I bought this one and it worked really well. Very pleased with the result. 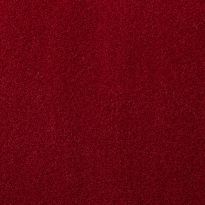 It's easy to apply a durable, professional looking interior liner that resembles velvet. The wife only wanted a single compartment box, 1/2 x 3" cherry (also from Rockler). Not fancy but very effective. Worked perfectly. 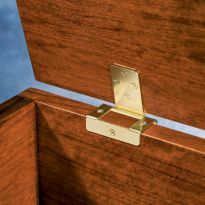 I bought a mini flocker at Rocklers in 2010 while making a jewelry box. It's very easy to use. I moved in 2015 and everything went into boxes. I had another project which I needed the mini flocker for, fortunately they are inexpensive so I now own two. Well worth it. 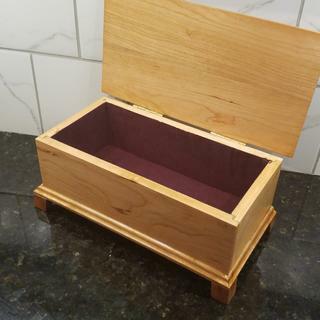 First time flocking the inside of small drawers in some bandsaw boxes, and this product was easy to use and creates a seamless and professional looking finished product. I recommend always using painter's type masking tape on all the surfaces you don't want flocking on. It makes it easier to apply the adhessive right up to the desired line and make the transitions from wood to flocking look very neat. The best way to describe it's " wonderful "!!! I had a problem with taping the edges. In the future I would seal the item with poly and skip the taping and just wipe off any excess right away. The product worked great. The taping not so much. Very easy to use. Basic concept. Was pleased with purchase. This is taking that extra step to make a box POP and customers notice. My only regret, not buying more colors at the same time to avoid extra shipping. it worked just as advertized and the final product was great. For a first time user it was easy and instructions very clear. Works great simple but gets the job done nice I use it for band saw boxes. I built a jewelry armoire and needed to line the small compartments in the drawers. I saw this product on line and ordered it with the glue and flocking materiel. It was easy to use and looked great when I was done. Will definitely use it again. 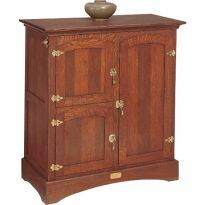 My wife wanted this amoire but we did not know how we were going to line the drawers. 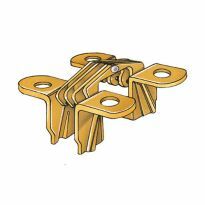 We found this product on Rockler and it worked perfectly and solved our problem. Another Rockler product that makes a mediocre craftsman like me look like a professional. Simple to use: paint adhesive on, fill the flock applicator with suede tex fibers and pump. Covers well, looks great and is resilient. Good choices in colors. Instructions were very clear. I still thought the product would be more difficult to use. In fact, it was very easy and the project turned out very well. I found it to work just as the instructions said it would. 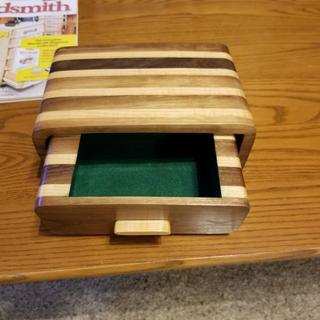 I used it on the inside of wooden cigar boxes and they look great. thanks for a great product. I was totally amazed at how easy it was to apply the glue and add the suede-tex to it. I made 12 boxes and added the suede-tex to all of them. I know I'll use it again. This is very easy to apply and gives professional results. I was amazed and very pleased with it. This was the first time I used this product and found that it worked perfectly. 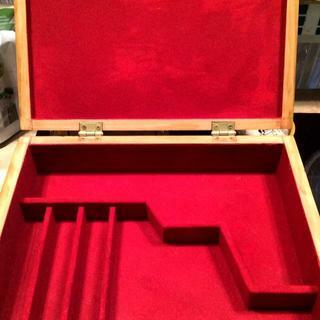 I had built a jewerly box and used this to finish the inside of the box. Came out great. This is a great and easy product to use. Because the adhesive is colored, if you leave a bare spot, or don't use quite enough of the fiber, it doesn't show. The adhesive sticks nicely on vertical surfaces and also cleans up nicely. A great and easy solution to finishing the rough insides of gourds (or any other box). Directions are clear and simple enough for a child to use, though I would recommend adult supervision and definitely a mask as the fibers are infintessimal. I was looking for tan or beige suede-tex fiber. Don't you have lighter colors? It was my first time to flock and I found it to be a great tool. I would definitely recommend it to anyone who wishes flock. First time building and flocking a pistol case. Easy to use and lays even follow directions and leave it alone for a day before removing excess fibers. It will make your project stand out . 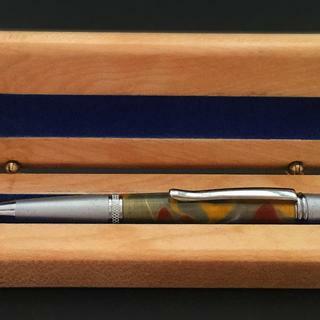 It completes the finished pen box. This was the first time I had ever tried this product. I followed the instructions and I was happy with the results. I like this product but had a bit of a time figuring out how to get a nice even thick coat. First of all the glue was a problem. It was very difficult to put on without brush strokes. It was hard to cleen up, and I always got it on my fingers. The brush strokes show through. I started spraying on water based sanding sealer. One coat to seal, then another very heavy coat before applying the flocking. I dont even paint the surface because if you get a nice even spray it will not show through, although you could paint if you wanted to. The other trick I came up wiht was this. I noticed that after the flocking was dry, anywhere I touched it, I left a finger print. What I do now is after the flocking is dry, tap off the excess flocking, so there are no clumps, then roll it with a rolling pin, like the kind that used for pie crust.. This presses the flocking down and gives a nice finish that does not leave finger prints. I realize this only works for flat pieces, but that Is what I do, I make boxes and the bottoms are flocked. 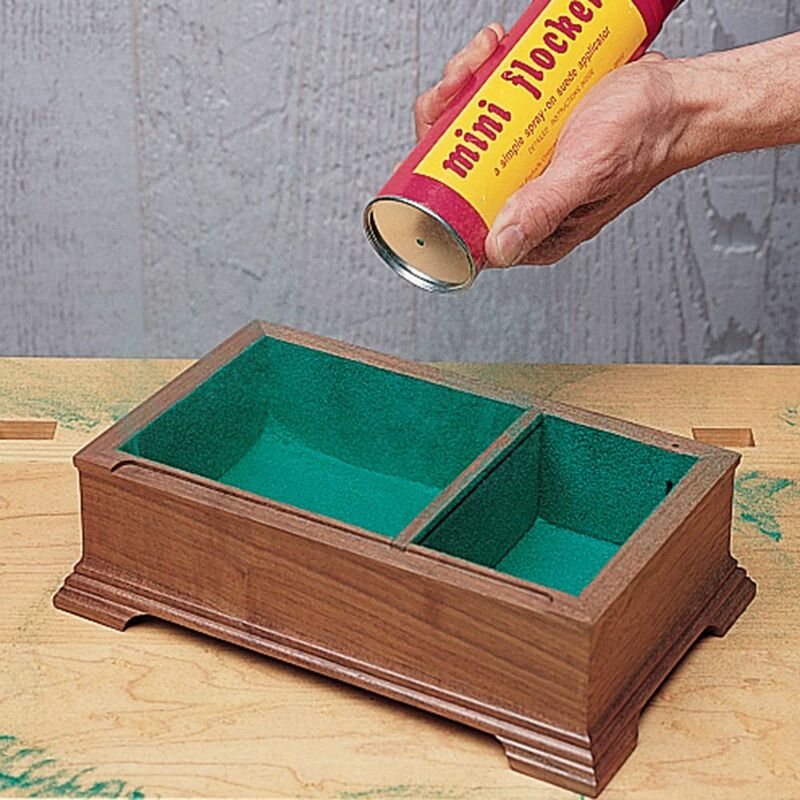 Using this spray technique, you can also put on multiple coats that cover up mistakes, and really make for a nice thick padded surface. Product covers well where the adhesive is thicker. Brush strokes may show otherwise. Allow several days for the odor to subside. Easy! Adhesive leaked a bit under the blue masking tape I put around the tops of the drawers, but I figure that was my fault for not getting it stuck down tight enough. I was able to scrape and sand it off after the flocking/adhesive dried. I followed a tip from a woodworking show, and used a matching color of latex paint instead of the special adhesive. Worked fine, and a lot cheaper. I tried it and found it to be a little messy and making sure the powder reaches the corners and sides and by doing that I had to use a flat plaster knife. Works as intended but really too expensive for what is delivered. I understand I need this to spray on the fiber. 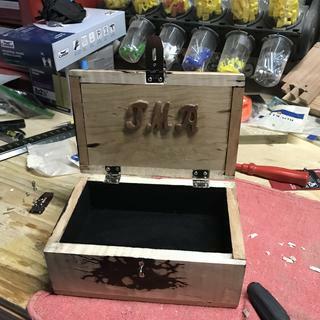 To give making my jewelry boxes a more professional look. adding new colors to my collection. I love this applicator. Even though something else would probably work almost as well, this is such a simple device that I love it. I imagine this product hasn't changed much since the 1950's. For limited box and drawer production, this inexpensive applicator appears to offer an effective option - and it brings back childhood memories of balloon inflators for those of us of a certain age. 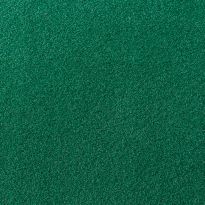 To apply the felt particles. I wanted to make the inside of a compass box look more finished. I build a custom jewelry box and wanted to flock the drawers instead of just having them all wood. I wanted to try flocking the inside of a box. I a making a musical jewelry box for my daughter. Looked like a good idea. Needed this to apply the suede fibers. I choose the manual flocker because of the price. I am just doing a small project. Maybe in the future I may order the compressed air flocker. 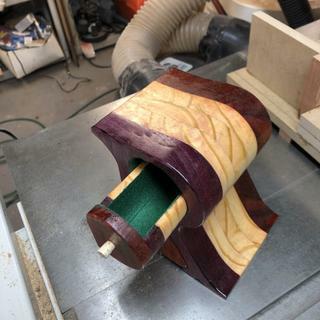 I made 9 jewelry boxes for my granddaughters and a friend rcomended that this was the best way to finish the insides. I am going to use to line boxes I am making. 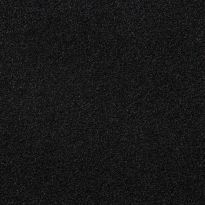 Do the fibers only come in these dark colors? Can I use other (white, ivory) fibers from another manufacturer with this applicator? BEST ANSWER: For something like this I wouldn't try it on a project until I had experimented on some scrap. The applicator is so inexpensive that the safe bet would be to use this applicator for Suede-Tex stuff and the other manufacturers applicator for the other manufacturers fibers. FYI, Suede-Tex does have both white and Ivory flocking fibers. Go tho their site to see the color charts. 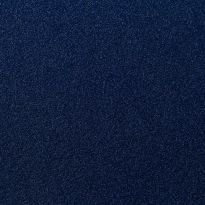 Is there any method to apply a second coat of flocking and fill out thinly covered areas and brush marks? BEST ANSWER: I've only done this once, but I applied spray adhesieve over the first coat of flocking and then applied a second coat of flocking. You must work quickly because the spray adhesieve dries fast. Good luck! Thank you Mary. Do you recall what kind of adhesive? And how did you like the result? Thanks again very helpful! We used 3M spray adhesieve and yes, we were happy with the results. 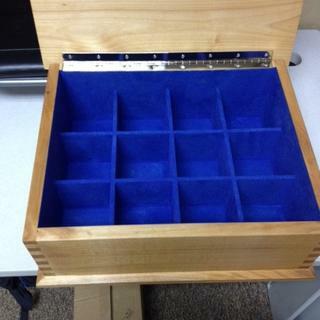 My husband used the flocker to line a memory box he made to give our daughter-in-law for her wedding day keepsakes. For the price... I couldn't ask for anything better!! But, to be honest I haven't try any!!! Can this be used as a roof liner in a vehicle? I have found that if the first coat doesn't cover you can put on another coat and it will look fine even if you spot it in. I suppose you can try to do this. I don't think it's a good idea. It would be a huge mess. and very very expensive. Thanks, Erick. However, at +/- $7.00 per 10-12 square feet, how could this be "very, very expensive"? Taking the roof liner backing out of the vehicle and working on a bench, how could this be very messy? I am just looking for a way to get away from sagging roof liners and still look half way decent. Appreciate any suggestions you may have. Being able to work on a bench changes things. It is easy to work with. But ever working on a little box is messy. I wish you luck. Will this product work on fabric shoes and how durable is it? BEST ANSWER: I know that the product is durable enough that auto restoration buffs use this product on dashboards. However, I'm not sure how flexible the finished product would be to be durable on a pair of shoes which I imagine would be moving and bending quite a bit. What is the spread rate per container? Also is there a video showing the application? BEST ANSWER: the spread rate would very depending on how much product you put in the tube. The system is very user friendly. There is a video on how to do it. Go to WWGOA .COM search for flocking. George has a good demonstration on how to do it. Very simple and easy. Is the adhesive made with formaldehyde resin?